My story is all too common. I was going on a mission trip to Uganda and I had sent support letters to my old high school teachers. In my letter I explained what God had been doing in my life and how he had led me to study philosophy at UCLA. That is when all the warnings started to come in. I vividly remember one letter I got back, it simply said “Beware of losing your faith. Colossians 2:8” As I said my experience i s all too common. Lots of Christians are averse or afraid of philosophy. 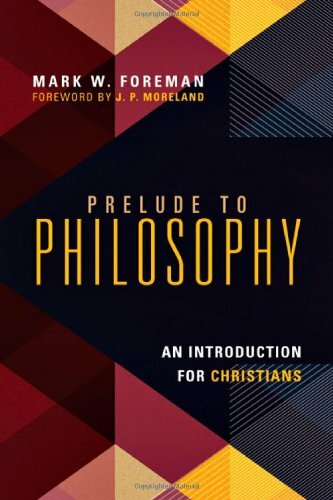 Mark Foreman’s Prelude to Philosophy shows us why Christians shouldn’t be afraid, but rather why they should purse a philosophical mindset. The book is broken up into two major sections. First comes a sort of prolegomena of philosophy. Foreman deals with questions like: What is philosophy? Why is philosophy important? Why is philosophy important for Christians? What does philosophy study? The second part deals with the methods of philosophy – logic, reasoning, fallacies, how to approach arguments – you might consider this a toolbox for actually doing philosophy. He concludes with a short epilogue on the virtues necessary for being a Christian philosopher. Its very relevant – Foreman opens up the book by saying that “there is no doubt about it: philosophy has a major public relations problem.” He is absolutely correct. Many Christians are wary of philosophy without good reasons. The fact is that Christian hesitation about philosophy comes out of a fundamentalist tradition of anti-intellectualism. This tradition is insulated from other world views (even other Christian traditions), is marked by Biblicism, and at times advocates for blind faith. This has caused many Christians who were raised in this tradition, or have an affinity towards this tradition, to fear doing philosophy. Foreman shows us why those fears are completely unfounded. This book addresses a very relevant need among Christians today. Part one feels disjointed from part two – this isn’t really an issue I have with the content, rather its an issue I have with the structure. To me it almost feels like two separate books. The first part is about the nature of philosophy, the second is about logic and reason. Foreman could have easily split these two sections into two smaller books. This isn’t something that makes me like the book any less, but my level of interest changed as I approached the sections on logic and reason. It needs more on the vocation of a philosopher – If you want and introduction on what it means to be a Christian academic philosopher don’t look here, look at Plantinga’s “Advice to Christian Philosophers.” I know that Foreman wasn’t writing to students struggling with a desire to become professional philosophers, he is writing for people who are struggling with the concept of philosophy in general, but part of easing the hesitations of novices of philosophy could have included a short section on how professional Christian philosophers are actually involved in doing ministry. Sidebar: somebody really needs to write a book about what it means to be a Christian professional philosopher. I know that there are a lot of articles and papers out there on that particular vocation, but we need a full fledged book on the subject. My favorite part of the book was the prologue – the virtues of a Christian philosopher. Its in this section that we see Mark Foreman’s heart really shine through. Christian philosophers ought to love truth, be diligent, be intellectually honest, treat others with fairness and respect, have intellectual fortitude, possess epistemic humility, and be teachable. Reading through this book its apparent to me that Foreman embodies these virtues. If there are any doubts that philosophy is for Christians just read this book, I am not talking about the content of it, I am talking about the heart behind it. Foreman has a pastoral tone, guiding, teaching, shepherding philosophical novices through the difficult terrain of philosophy. Foreman is a gentle shepherd, leading philosophical novices through the difficult terrain of philosophy. Note: I received this book free of charge from Intervarsity Press in exchange for a review. I was under no compulsion to give it a positive or negative review.